Our Word of the Month for March 2015 is ‘Ned Kelly beard’: a full beard. 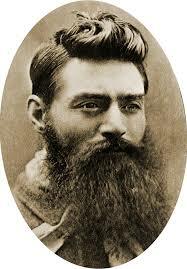 Like many men of the late 19th century, Australia’s most famous bushranger Ned Kelly sported a large bushy beard. In recent times the full beard has made a comeback in Australia, and so has the term ‘Ned Kelly beard’ which is first recorded from the 1930s. You can read the full Word of the Month in PDF form on our website or read it in an online format.